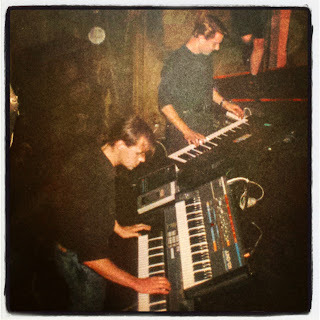 We had a short residency at an Adelaide nightclub called Infinity in September/October 1989, and would perform onstage with synthesizers, a sampler, a drum machine, hardware sequencer and four go-go dancers on podiums (see photo below). A cassette player with a prerecorded 30 second "Club House Theme" was utilised between songs, to buy us the half-minute required to load sample and sequence data from floppy disks into the onstage equipment. Whilst some 4-track cassette recordings were made at the time (this was before the digital home recording revolution), none of those compositions were professionally recorded or released. I retained the programmed data and most of the equipment used by Club House. Working from the original data programmed by Paul and myself in 1989, which had been carefully archived on Quick Disks, floppy disks and cassette tapes, and utilising the same synthesizers, sampler, sequencer and drum machine used 28 years prior, I revived and reworked the Club House song "Acitech". Most of the original programming, sounds and samples remain, but with updated production. The mix is named the "Infinity Mix" as a sentimental reference to the nightclub where the song was performed live. Infinity, previously the site of Adelaide's legendary Toucan nightclub, was located at 181 Hindley Street in Adelaide, and as of 2017 the same building still serves as a nightclub. 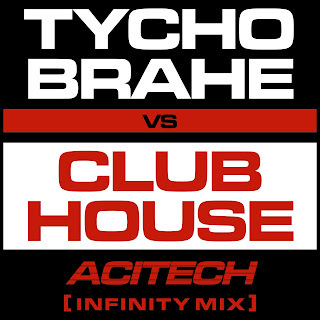 The recording is credited as "Tycho Brahe vs Club House" as it spans both bands of which I was a member, and whilst not strictly a Tycho Brahe release, neither is it a Club House release - it stands as an odd hybrid utilising the almost three decade old programming of one creative endeavour, and the production techniques of the other. Acitech [Infinity Mix] is available for download from Bandcamp and CD Baby, and will soon be available on iTunes, Spotify, Amazon etc...click on the picture above or to the right to "check this out" on the Bandcamp page, where you can listen to the entire song.